Folger Tech FT-5 filament guide ("reverse bowden") brackets by evandepol is licensed under the Creative Commons - Attribution license. During initial testing with the FT-5, I noticed how the hotend movements are also dragging filament off the spool. Given the high travel speeds of the x-y carriage on an FT-5, I didn't feel it was a good idea to let the same movement also unwind a heavy filament spool at the same time. I also own a Kossel, which has a a bowden setup where the extruder is mounted on the frame, a bowden tube feeds the filament to the hotend. For the FT-5, I didn't plan to move the extruder, but simply having a bowden tube still means that the distance from the spool to the hotend stay the same, regardless of the hotened carriage position. So I made a clip to mount on the real, above where my spools are, with a 5mm pneumatic connector, connecting a standard PTFE tube long enough to reach from the mounting position to every possible position of the hotend carriage. 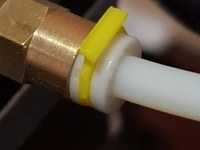 The PTFE tube runs to another pneumatic connector on the hotend carriage. I wanted to have the pneumatic coupler as high as possible, to give some room to thread the filament into the extruder, and using the existing mounting screws at the top of the hotened carriage assembly. Lastly, I'm not a fan of the cable clips, so I included a simple bracket that I use with a zip tie to lash the cables to new bracket. (Credit to this design which inspired mine: http://www.thingiverse.com/thing:1633674). 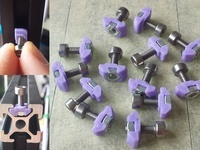 After printing, use a small drill to make sure the filament feed holes are wide enough to reduce friction. Use pliers and a little bit of persuasion to screw the 5mm pneumatic couplers into the openings on the two clips. 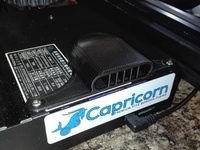 The rail bracket goes wherever you have your spools. I have mine in the middle of the front top rail, and above where the spool uncoils, so that there is a more or less straight path from the spool into the tube. 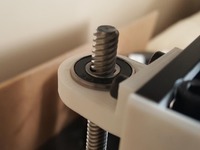 The hotend bracket goes on the top of the carriage using the existing screws. Just mount them the other way around (with the nyloc M3 nuts on the front). Use a zip tie on the left to secure your hotend wires into position.